Re-connect to your roots and ground yourself in one of the most stunning natural surroundings in the world, one of the purest and cleanest place to be. Imagine yourself high up in the Alps, where the air is pure, life is slow and simple and worries seem to just disappear into lush green valley. This is a place where you can take a deep breath, relax your mind and re-connect to the essence of life—to why you are here, to nature, and to simplicity. You will stay in an exclusive and cosy mountain chalet where you'll enjoy hand-delivered daily breakfasts, morning meditation and yoga, outdoor jacuzzis overlooking the stunning alpine views, a cleansing fire ceremony, and a special guided trek to look for medicinal herbs with a local expert. This retreat has been created for you to ground yourself and return to simplicity whilst enjoying a luxurious but natural surrounding. It is a journey for you to come home. To yourself. To your deepest essence. To your soul. You'll begin each morning with silent meditation and breath work. Then, you will strengthen, stretch, and deeply connect the layers of your being through an invigorating vinyasa yoga practice. Expect a more grounding practice at the beginning of the retreat, but once you feel more settled, you'll also learn how to fly in our postures and get more playful. A hearty breakfast will be brought to your chalet in a basket: homemade bread, local products from the farm, herbal teas and coffees, granola and yoghurts, and some savory options for you to enjoy in the dining area of your chalet. Your host, Roswitha, will make sure that you feel satisfied and healthy. Fruit and tea will be available throughout the day for snacking. Some afternoons are free to enjoy the jacuzzi overlooking the Alps, get a sweat on in the adjoined sauna ,or just put your feet up and daydream. On two afternoons you'll explore the area by foot—your experienced mountain guide will lead you through green paths to the best views. On one day, your herbal expert “Josef” will guide you on a trek to look for medicinal herbs. He is a real connoisseur and will explain how to pick them, what they are for, and how to use them. You'll learn examples of how to use these natural herbs medicinally, depending on what you find. You will close the day with a restorative yin yoga class, and maybe a special workshop on breath techniques or meditation. Then, the whole group will come together to enjoy a healthy dinner on the big dining table to feast on local delights and enjoy a nice glass of wine and good company. On clear days you may be even able to do some stargazing before heading to bed. One night, you'll participate in a very special fire ceremony to let go of the old and invite the new. Feeling cleansed physically and energetically, you will have more space for new ideas, more motivation and energy to go forward in life! Rustic, luxurious mountain chalets with an authentic Austrian design and all the commodities you need to stay comfortable. At 1400m above sea level lie 5 exclusive mountain chalets called “Lichteben”, meaning the hill of light. Each chalet has been lovingly designed and is themed around a different medicinal herb. 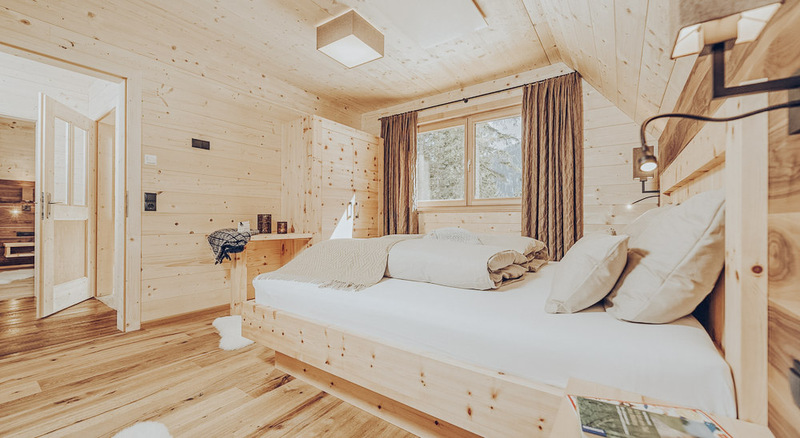 Each chalet consists of two Double bedrooms, a cosy lounge area, kitchenette, bathroom, sauna, and two of them have an outdoor jacuzzi! One chalet is perfect for two friends, two couples or, if you are travelling alone, you can share with a new friend. These rooms come with one plush Double bed and share a bathroom with the other Double Room in the chalet.